You have to love what's going on at A Wong. It's not often you get an utterly original take on traditional Chinese dim sum that, more often than not, works. This is Chinese food rooted in tradition, but taken up more than one notch. It's definitely not your Grandma's dim sum (if your grandma was Chinese that is, which mine is not, but you know what I mean). I went in early January to meet up with some Instagram chums from Denmark and we ordered a decent chunk of the dim sum menu which is only available at lunch. It's a fairly small venue but we snagged a table by the window looking out onto Wilton Road, which is only a 5 minute walk from Victoria station. It's not the most atmospheric of locations but make the trek from Chinatown and you're bound to have a fine meal. Between the four of us we managed to sample a good deal, but there's more that I'd return for on the "Snacks" section of the menu and other options like a Peking Duck Feast too. My test of good dim sum is always ha gaw - prawn dumplings. You can tell if the ingredients are fresh by the taste of the prawns, while the thickness of the wrapper will tell you about the attention to detail of the chef. The ones at A Wong passed my litmus test on both fronts, but I thought the citrus foam unnecessary. There was more success with other dumplings though. 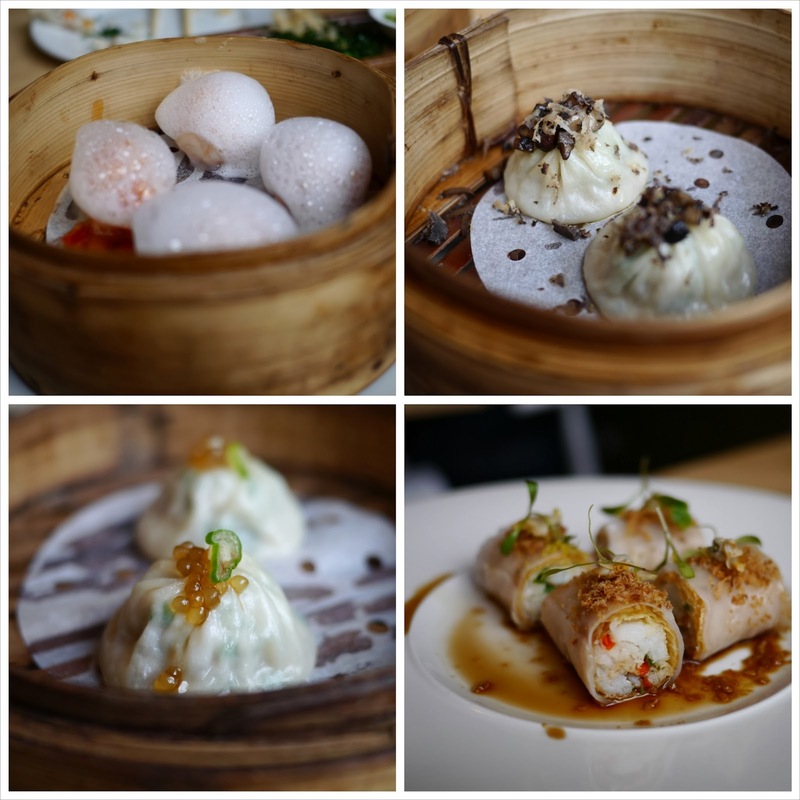 The Xiao Long Bao were some of the finest I've eaten in London (see my thoughts on probably the most famous ones in the world here). The XLB's came in several variations (the mushroom, pork and black truffle version filled the table with heady aromas) and had some of the thinnest wrappings I've had in London. Perhaps they were too thin since the casing pierced more than once spilling the precious contents into the bamboo steamers. 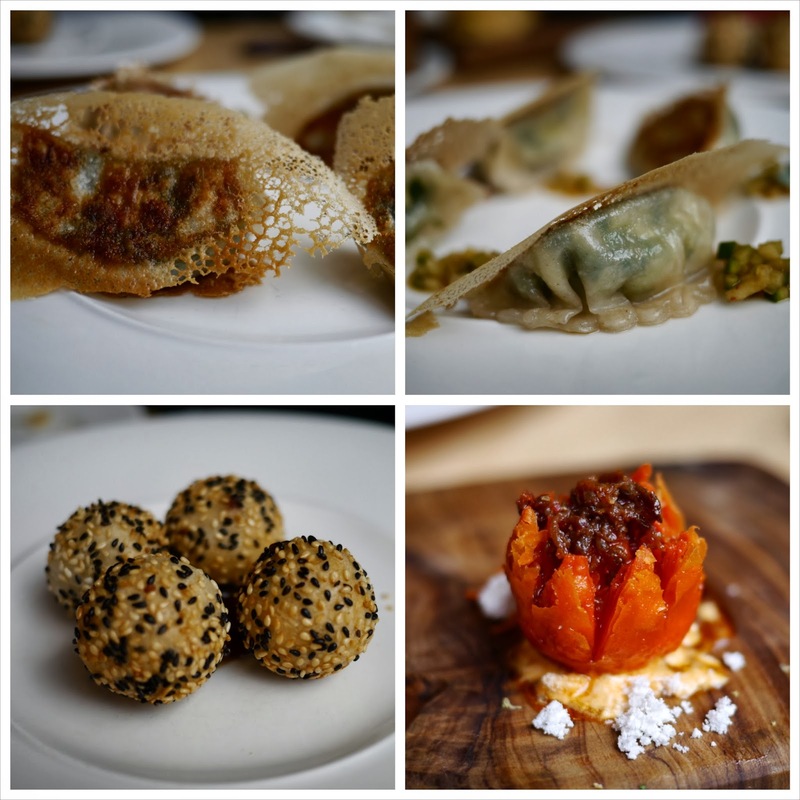 Other favourites were the foie gras sticky sesame dumpling and a playful riff on Wu Gok, or fried taro dumplings, with the quail egg croquette puff - each little mouthful a perfectly judged textural treat. I was also lucky enough to bag the last scallop puff in XO sauce of the service (because as I've mentioned before I love anything in XO). I thought the pastry here was just a touch too thick, but this was still a great mouthful. If there was a dish I didn't love, it would be the pot sticker dumpling, despite the gorgeous lattice of the wrapper. It was served with sharp pickled cockles, the acidity from which overwhelmed all the other flavours. The dumplings are generally priced per piece and our waiter recommended a choice of around 8 for a reasonable sampling of the menu. Overall, the pricing is a step up from the higher end dim sum places in London like Bright Courtyard or Royal China Club but its not outrageously priced. Typically I average around £20 a head when I eat dim sum and this was closer to £30 (with chrysanthemum tea), but I thought it was worth the extra price for the ingredients, techniques and inventiveness on offer. Service was helpful and friendly throughout, and like most dim sum places, the food comes out at a frantic pace. The menu continues to evolve with the chef refining the product and introducing new variations of old favourites over time. Follow him on Twitter to track the latest creations (I'm looking forward to the wonton noodle soup). For me, this creative, perfectionist spirit means a repeat visit is very likely. WANT. Right now. Definitely on the list! It's worth a visit. He's currently perfecting wonton soup and made-to-order char siu, so I'm definitely heading back!